These herbaceous candles are made from domestically-grown soy and come packed in seed-infused packaging. 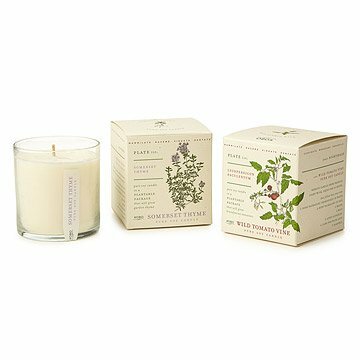 Close your eyes, breathe deep, and be transported to a garden dense with vine-ripened tomatoes and dusty sommerset thyme with these botanical soy candles. Redolent with the rich scents of popular herbs and veggies, these lovely candles pack a powerful punch of aroma since they're made from 100% domestically-grown soy, a biodegradable and renewable resource that burns longer and cleaner than paraffin. After these delicious scents have filled your home with their earthy fragrances for 60 hours, the elegant packaging carries with it another treat: the boxes and petite paper discs that protect the candles' surfaces are infused with seeds. After soaking the packaging and burying it beneath a layer of soil, a patch of brandywine tomatoes and garden thyme will sprout in just a few weeks. Made in New York. 3" H x 3.25" dia. Candle will get very hot while burning, do not touch glass while lit. Keep away from flammable materials, never leave burning candle unattended. These make such great gifts. I gave one to my sister for Christmas and my best friend as a housewarming gift - they both loved them! The candle was very high quality. It smelled wonderful. And lots of fun anticipating planting the packaging. These candles smell AMAZING and the packaging looks very nice, too. Both my mother-in-law and grandmother-in-law love them and are excited to plant the packages in their herb gardens. The fact that these are soy candles and therefore burn clean was also a huge selling point for us. Outstanding product all around! MIL loved this candle! Set it on the table and lit it right away. Looking forward to planting the packaging too. I love the idea of this candle/seed combination. I purchased the tomato candle as a gift and personally do not like the scent of the candle. I think it's a little harsh smelling but have not burned it yet so maybe it will smell better when burning. I am definitely going to buy this product again because I want to smell the other scents! I bought this and had it sent to my mother. She loved it! She called me talking about how great it smelled and how she had just bought the perfect planter for the seeds. I am an avid cook and do not like scents in my kitchen that compete with my cooking. This candle is a perfect purchase since it just adds a lovely scent. Love the idea and scent! I purchased this for my mother and she absolutely loved it! She loves candles, she loves gardening and tomatoes is one of my favorite food items. So it truly was the perfect gift. She was very excited when she opened it and appreciated it's uniqueness. Very happy with the purchase and highly recommend it for anyone who is considering it.